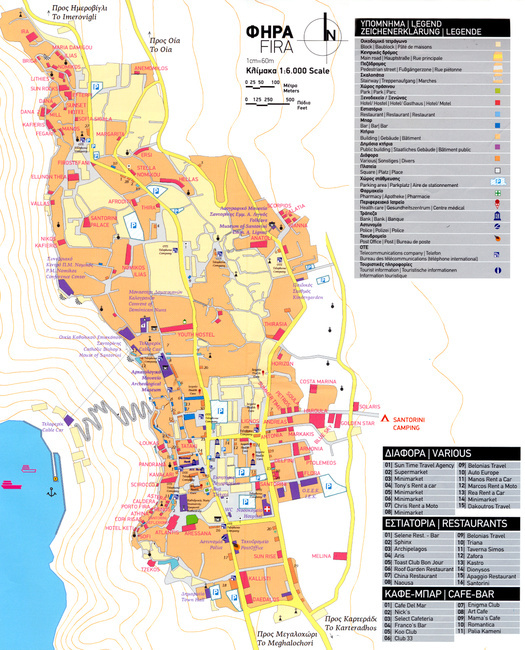 This photo is a detail showing a street map of Fira, and is taken from a large, fold-out map of Santorini that is distributed to attendees at the conference. The map is useful, for example, to people who are booking hotel rooms and want to know where in relation to the Nomikos Centre a given hotel is located. Not all hotels are shown on this map (notably missing are Belvedere, Homeric Poems, Galini, and Agali, which are all along the caldera edge between Nikos Kafieris and Pegari; also missing is Reverie just a bit north of Sofia Sigala). The Nomikos Conference Centre is the purple building at the left edge of the settled area, slightly more than halfway up the page. A higher-resolution PDF version of this image can be downloaded here.